Alpine Mono Power Amplifier Mrp-m1000. Condition is Used. Shipped with USPS Priority Mail. • Alpine's Class D amplifier circuit with Dynamic Peak Power (D.P.P.). • CTA-2006-B Specifications: 200W RMS x 1 (4Ω, 14.4V, ≤ 1% THD N). The KTA-30MW is ready for your adventures. It is weather resistant, rated at IP66 for protection against dust ingress and high-pressure water spray. R-A75M - Alpine Monoblock 750W RMS R-Series Amplifier. 500 watts RMS x 1 at 4 ohms (750 watts RMS x 1 at 2 ohms). Mono subwoofer amplifier. Wiring and hardware not included with amplifier. Variable bass boost (0-12 dB at 50 Hz). Alpine MRV-M500 Car Amplifier. Alpine MRVM500. 8-1/4"W x 2-3/16"H x 7-15/16"D. CEA-2006 compliant. Here we have a Alpine MRP-M850 Mono Power Car Amplifier. In good working condition. GAURANTEED NON DOA. This amplifier puts put close to 1,000W RMS. The MRP-M850 mono amplifier will power your subwoofer with 500 watts of power. Its an Alpine quality is expected it sounds louder than what its rated. It is sold as is any warranty through manufacturer if available. Minor sign of use. Functional Condition You will get what is shown on the pictures. BBX-F1200 - Alpine 4-Channel 1200W Class AB BBX-Series Amplifier. Class-A/B 2-ohm Stable 4-Channel Amplifier. 3-way protection circuitry (thermal, overload, and speaker short protection). 4/3/2 or channel operation. Alpine MRP-M500 1-Channel Car Amp. Condition is Used. Shipped with USPS Priority Mail. Brand New In Original Box Alpine PDR-M65 Mono Digital Amplifier With 650 Watts RMS at 2-ohms and 450 Watts RMS at 4-Ohms. Shipped FREE with UPS Ground. Alpine Verification Certificate. Mono subwoofer amplifier. mono subwoofer car amplifier. 150 watts RMS x 1 at 4 ohms (250 watts RMS x 1 at 2 ohms). Car Amplifiers. Car Subwoofers & Speakers. Car In-Dash Units, Receiver. The item, is scratched, scuffed and has rust on the wire connection ports. There is also sticker residue on the top and bottom and a deep scrape on the top logo. Teh amplifier has been tested and is working well with no known issues. This new BBX amplifier gives you Alpine power performance at an amazing price. And they’re designed to fit easily in virtually any system. • Alpine 4-Channel Amplifier. 4 channel power amplifier 4/3/2 channel 600 watts. Dual internal error correction technology which had previously only been available in the PDX and X-Power amplifiers, is now integrated in V-Power mono amplifiers. The audio input signal is analyzed, compared, and corrected twice dynamically as the signal is processed through the amplifier. 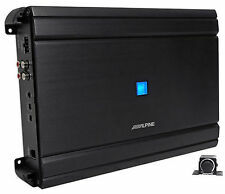 Alpine PDX-1.600 1-Channel 600W Car Audio Amp-Amplifier - used. Tested . Condition is Used. Surface scratches on top and mainly on bottom. Some numbers missing. Cover for tuning is missing. Alpine S-A60M. Mono subwoofer amplifier. Rigid, Smittybilt, ARB, Westin and hundreds more! variable bass boost (0-12 dB at 50 Hz). variable low-pass filter (50-400 Hz, 24 dB/octave). DONT BUY FROM AN UNAUTHORIZED DEALER AND END UP WITH NO WARRANTY. MRV-M500 - Alpine Monoblock 500W RMS 1000W Max Amplifier. Monoblock Bass Amplifier. 1000W Max x 1 2 Ohm. 600W Max x 1 4 Ohm. Easily adjust the bass gain of your amp while seated inside. The S-Series amplifiers contain technology that was previously only available in our premium line up of amplifiers, the R- and X-Series models. With an improved heat sink, and protection circuit design that eliminates thermal shut-down, your music will keep playing no matter where your drive takes you. S-A60M - Alpine Monoblock 600W RMS S-Series Amplifier. 600W RMS x 1 at 2-Ohm ≤ 1% THD N. Mono subwoofer amplifier. Variable bass EQ. Variable low pass crossover. 330W RMS x 1 at 4-Ohm ≤ 1% THD N. Auto turn-on with remote sensing. 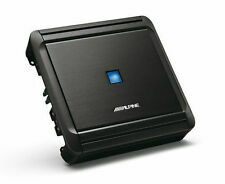 Alpine S-A60M Mono Digital Subwoofer Amplifier - 600 Watts x 1 @ 2-Ohms & 330 Watts x 1 @ 4-Ohms. 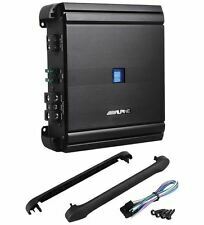 The S-Series Amplifiers have a diagnostic LED located behind the blue Alpine Jewell on the top of the amplifier. Alpine MRD-500 1-Channel Car Amp. · We operate in Ocean County, New Jersey. You can rest assured that your order will make it there in one piece. You must also ask for a quote before purchasing. We do our best to ensure that everything goes smoothly, but mistakes can and will happen. 350 watts RMS x 1 at 4 ohms (650 watts RMS x 1 at 2 ohms). variable bass boost (0-12 dB at 50 Hz). variable low-pass filter (50-400 Hz, 24 dB/octave). variable subsonic filter (min-40 Hz, 24 dB/octave). MRV-M1200 - Alpine Monoblock 1200W RMS Class D Amplifier. Amplifier Type: Class-D (Digital). Board Circuitry: S.T.A.R. Circuit. Bass EQ: Bass EQ Function. Channel Design: 1 Channel (Mono). Heat Sink (WxHxD) in: 6.50 x 2.16 x 7.87 in. 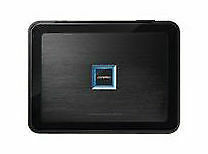 Alpine MRV-M500 500W Mono Channel Class D Subwoofer car Audio Amplifier. 300 watts RMS x 1 at 4 ohms (500 watts RMS x 1 at 2 ohms). variable bass boost (0-12 dB at 50 Hz). variable low-pass filter (50-400 Hz, 24 dB/octave). PDR-M65 - Alpine Monoblock 650W RMS 1300W Max PDR Class D Amplifier. PDR Series Monoblock Class D Car Amplifier. Variable Bass Boost (0 to 12 dB bass boost at 50 Hz). Subsonic filter (24 dB at 15 Hz). Alpine MRVM250. Labor Warranty 1 Year. Parts Warranty 1 Year. Outputs No. Harness Preamp. Speaker Level Inputs. Fan Cooled No. This new BBX amplifier gives you Alpine power performance at an amazing price. And they're designed to fit easily in virtually any system. EQ (Equalizer): Bass EQ Fixed Frequency 45 Hz, Q=0.5, Variable Gain 0dB to 12dB (3/4 Ch only). MRP-M650 MONO BASS. mono subwoofer car amplifier. tuned Bass EQ (12 dB bass boost at 50 Hz for channels 3 & 4). tuned Bass EQ (0-12 dB bass boost at 50 Hz). BOTH AMPLIFIER ARE USED AND ARE BEING SOLD AS IS UN TESTED. 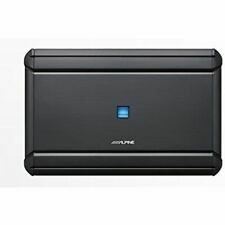 ALPINE MRV-M500 CLASS D MONO SUBWOOFER POWER AMPLIFIER "BRAND NEW"
5 out of 5 stars - ALPINE MRV-M500 CLASS D MONO SUBWOOFER POWER AMPLIFIER "BRAND NEW"
63 product ratings63 product ratings - ALPINE MRV-M500 CLASS D MONO SUBWOOFER POWER AMPLIFIER "BRAND NEW"
Variable subsonic filter. Auto turn-on with remote sensing. EQ (Equalizer): Bass EQ Fixed. Alpine MRV-F300 are bridgeable, b oth the front and rear sections. I t can be used as a 4-channel, 3-channel, or 2-channel amp. A speaker level input harness is included, making it easier to add the amplifier to a factory radio or to a receiver with no preamp outputs. 200 watts RMS x 1 at 4 ohms (300 watts RMS x 1 at 2 ohms). Compact mono subwoofer amplifier. Wiring and hardware not included with amplifier. Class D amp technology. Channel Design: 1 Channel (Mono). Input Sensitivity (Speaker Level Input): 0.4 - 10 V. THD N (Rated Power into 4 Ohms): ≤0.2 %. THD N (Rated Power into 2 Ohms): ≤0.3 %. Signal to Noise (Rated Power into 4 Ohms): >105 dB. ALPINE PDX-M6 AMP MONOBLOCK 600W MAX SUBWOOFER AMPLIFIER CLASS-D PDXM6 SUB NEW! Monoblock class-D amplifier (with four 20A ATO fuses inserted in chassis). ALPINE PDX-M6 MONO CAR AMPLIFIER. mono subwoofer amplifier. ALL ALPINE PRODUCTS. ALPINE PDX-M6. Alpine PDX-M6 owner's manual. 5 out of 5 stars - ALPINE PDX-M6 AMP MONOBLOCK 600W MAX SUBWOOFER AMPLIFIER CLASS-D PDXM6 SUB NEW! 12 product ratings12 product ratings - ALPINE PDX-M6 AMP MONOBLOCK 600W MAX SUBWOOFER AMPLIFIER CLASS-D PDXM6 SUB NEW! Alpine MRV-V500 Five Channel Power Amplifier. Dual internal error correction technology – which had previously only been available in the PDX and X-Power amplifiers, is now integrated in V-Power mono amplifiers. CONDITION: NEW. CTA-2006-B amplifier Specifications: 900W RMS x 1 (2 Ohm, 14.4V, ≤1% THD N). • 90dB S/N (ref. 1W into 4 Ohm). • 600W RMS x 4 (4 Ohm, 14.4V, ≤1% THD N). • CTA-2006-B amplifier Specifications: 900W RMS x 1 (2 Ohm, 14.4V, ≤1% THD N).